Bad odors and smelly situations are something that every RV owner has to deal with. One of my biggest concerns when I got Starter RV was whether I could deal with the sewer components, including smelly mishaps. But several years in now, and things, including RV odors, are not as bad as I feared. Here are our tips for keeping the smelly situation in control in your RV. The common thread to all the tips is to regularly do a full and complete cleaning of the RV. This is extremely important before and after any long-term storage, when RV odors and other problems are most likely to occur. In your sticks and bricks house, you’ve got plenty of room for odors to dissipate. When you condense 2,000+ square feet into a couple hundred, all the odors are magnified. When you look at what causes odors in the RV, you’ll find that you can prevent many of them with some basic preventive actions. Food is one of the biggest causes of RV odors and one of the easiest to prevent. First, as much as possible, cook outside. Fire up your new Coleman grill to cook everything from breakfast to the midnight snacks. By cooking outside, you’ll keep all those odors outside. And hopefully the trash too! While on the subject of food, make sure you clean out the fridge and the pantry of all perishable food. Don’t let food rot between games/trips as it is sure to lead to a smelly mess. Leftover food is also likely to attract ants, mice, and other rodents, so you’ll get additional benefits beyond odor control by keeping the food to a minimum inside your rig. Water also is a big cause of odors – mold and mildew not only cause bad RV odors but could present health issues with prolonged exposure. Make sure that you inspect your roof during annual maintenance. If you store your RV outside, you’ll probably have to repair the seals every couple of years, as the sun, rain, and other elements weaken it much faster than if it was sitting in a protected garage. If you do find a water leak, you need to address it immediately to prevent mold and mildew from growing. And in case it needs to be said, don’t smoke cigarettes or cigars inside the RV. Keep those for outside, because you will NEVER be able to get those smells out of the RV. Many RV odors are caused by stale air. By simply opening up the RV vents, windows and doors on the regular, you can reduce odors quickly. As part of the monthly maintenance during the offseason, I run the generators and ventilate the rig for a few hours to keep the odors to a minimum. Regular attention to the rig, even during the offseason, also lets you find problems that you may have failed to prevent, like those oranges that “someone” left in the sink after the championship game. Obviously, if you couldn’t help but cook inside, you’ll want to keep the vents and exhaust running while you cook and until the odors have dissipated after you have finished cooking. Some RV owners have installed Fan-tastic Vents which you can leave open even during rain (one reason you are probably cooking inside). 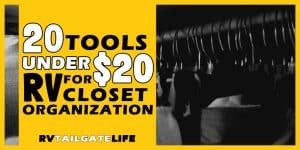 I wouldn’t recommend leaving these open during the offseason, but they sure are handy during tailgates to get rid of smells quickly. This particular tip is a combination of prevention and air circulation but focuses on the kitchen fridge. First, prevent a smelly fridge by keeping foods to a minimum, keeping only what you will use and throwing out any expired or rotting food. Just like in your home fridge, use baking soda or charcoal to absorb odors. I also recommend a small battery operated fridge fan – helps circulate the air inside (prevent stale air odors) and this one from Camco even has charcoal filters to help absorb the fridge odors. If possible, keep your RV plugged in during storage. It won’t take much power if you are not regularly running everything in the RV, but can help dramatically with the fridge. Have you ever turned off and left a fridge closed up for a long period of time? Mildew and mold was sure to greet you upon your return. By leaving the fridge running on the warmest cold setting, you can avoid this problem. If you can’t leave the fridge powered, make sure to leave it propped open to allow air to circulate, the water to evaporate, and prevent growing problems. No matter, keep the fridge clean and you’ll give the mold and mildew less fuel to grow on. Fabrics hold odors better than hard surfaces and typically require more effort to clean. Most RV owners remember to wash the sheets and maybe even the bedspread on the regular. But what about the drapes? When is the last time you took them down and ran them through a washer and dryer? Drapes can collect not only horrible odors but also lots of dust, leading to allergy problems. What about the sofa? Have you at least Febreze’d it recently? Sometimes though, Febreeze is just not enough. Particularly if you have pets in your RV, you will want to run a vacuum over the sofa and chairs regularly to get the pet hair up. You may also want to invest in slipcovers which can easily be removed and washed. You’ll also save a lot of wear and tear on the sofa, making it last longer. Or in the case of Starter RV, hide the hideous early 90’s blue fabric. Look into scented wash boosters too. They act a lot like fabric softener but leave your washables smelling good longer. In an RV that is only used on occasion, the extra smell good laundry boost can last weeks, making it a lot more pleasant for a weekend warrior. Keeping some dryer sheets around can keep laundry smelling good too. Tip: Get the same brand and scent for the laundry detergent, wash booster, and dryer sheets to keep your RV from smelling like a perfume store. I always forget about RV carpets since I already have laminate in Starter RV. My recommendation is to get rid of the carpet and install laminate. But if that’s not an option, be sure to regularly vacuum the carpets. Add baking soda an hour or so before vacuuming to help with the odors – just like you would at home. It is also easier to clean rugs than carpet, so consider putting rugs on top of the carpet; rugs are to carpet what slipcovers are to sofas. Black water tanks…. where do we start? First, empty out the tanks regularly. If you are in the South, the heat just leads to more smelly problems. Due to the limited water supply in the RV, the concentration of waste to water is higher than at home and that leads to smelly situations. As a weekend warrior, you’ve probably also got fewer worries about running out of water, so use plenty in the black water tank. The additional water will also help to make sure everything drains properly and there is not a build-up of toilet paper. Remember, nothing else goes down that drain! Most RV owners also use some type of chemicals to help control the black water tank odors. Make sure that the chemicals you choose aren’t hazardous. Starter RV uses the Calgon and Borax combination to control black tank RV odors. Starter RV now uses RV Black Tank Cleaning Bombs to control black tank RV odors and to keep the tank from getting clogged. Related to the waste water tanks are the p-trap drains leading out of the shower and kitchen and bathroom sinks. When you put your RV into storage, bacteria can grow in these traps. Mix some baking soda in a gallon of water and pour some down each sink and the shower. Whatever is left can do down the last sink, to help maintain the gray tanks. You probably don’t spend as much time on the gray tanks as the black tanks, for obvious reasons, so the baking soda can help. Also, never send food waste down the kitchen sink. This isn’t your home kitchen sink with the garbage disposal and the pipes taking away the waste. One fellow tailgater told me the story of the shrimp peels that got in their gray water tank – and it doesn’t end well. The freshwater tanks may not lead to quite the problems that the waste tanks do, but the freshwater tanks can lead to many RV odor problems. We will start by going back to our first point – prevention is the key here. Don’t leave the freshwater tanks full during long periods of storage. The water will stagnate and bacteria can grow in it, leading to more than just smelly problems. So drain those freshwater tanks if you aren’t going to be using the RV for a few weeks. After long periods of storage and if you happen to get a bad tank of water full of sulfur, you’ll need to sanitize the tanks. You sanitize the tanks by adding diluted bleach and water then filling and emptying the tanks several times until you no longer smell the bleach. It’s more complicated than that and a topic for a future post. Wait, the awning smells too? You’ll know just how smelly an awning can be the first time you pull it out after storage. If you are like me, you can store the RV at your house and perform regular monthly maintenance checks during the offseason. I’ve mentioned running the generators and venting the inside, but I also try to pull the awning out to let it air out as well. 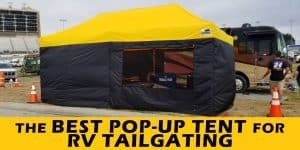 This works best on a sunny day when the sun can dry the awning out completely before it is rolled up again. For particularly smelly situations, a good cleaning can do. Pick up an awning cleaner that also has UV protection in it to keep your awning look better for longer. While it is not ideal, sometimes there is only one thing left to do to deal with RV odors – mask them! Since many odors are caused by bacteria, I recommend an air disinfectant that also smells good. Some of the disinfectant sprays can be used on hard surfaces like the kitchen countertop, soft surfaces like the fabric sofa, and in the air. You know us RV owners, always looking for multiple uses out of one product, so the Lysol disinfecting spray fits the bill. You’ve probably seen these satchels on Pinterest, as I did. I decided to test out this little project with some of the leftover laundry booster after I washed the sheets. The little mesh organza wedding bags (available from Amazon at 100 bags for $3.18) are filled with the laundry booster and then left inside the RV. I have put a couple of them around the RV – one hangs from a hat hook over the sofa (see picture) for maximum air circulation and another in the over-the-door organizer in the intersection between the kitchen, the bathroom and the closet. They do actually work to provide a pleasant scent without overpowering the small space. Good luck in keeping the bad RV odors to a minimum! Hopefully, some of these tips will help you. The chlorine dioxide gas penetrates into places that you’ll never otherwise be able to get to – in the cracks and crevices of the RV. Behind the sofa. And it is non-toxic and safe for the environment! Just make sure you open the cabinets and help the gasses get into the hard to reach places. Leave the RV closed up for at least 4 hours, better about 24 hours. Set off a Biocide RV Shocker Deodorizer to kill any lingering smells in the RV. of RV Shocker Deodorizer when ordering directly from Biocide! How do you handle RV odors in your rig? 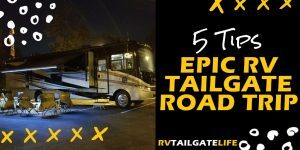 Comment below or join the conversation on Twitter by mentioning @RVTailgateLife. Like these tips to deal with RV odors? Pin for later! Tax Time: Does An RV Qualify for Tax Deductions?